ADORE Cricket Club won by 58 runs. 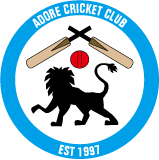 ADORE Cricket Club won by 33 runs. Powered by XOOPS Cube 2.1© 2001-2006 XOOPS Cube Project | Copyright (C) 2008. All rights reserverd.